Posted byWholeDude	 September 21, 2009 July 7, 2010 4 Comments on EAST AND WEST – WHAT SETS US APART IN LEARNING AND CREATIVE WRITING? 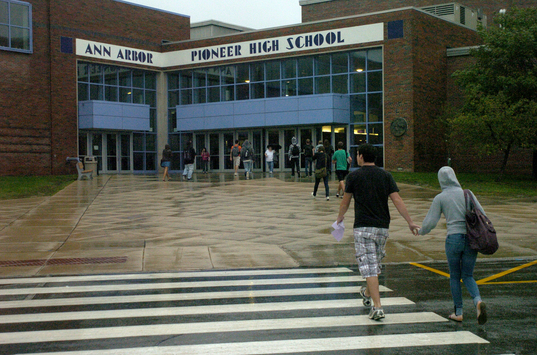 Pioneer High School, Ann Arbor, Michigan. The Students started a new School Year on September 08. My children in the past had attended this School. In the past ten years, I had visited this building countless number of times particularly after the School is closed at the end of the day. Lord Shiva, the God of Learning insists that we should seek the ability to think for ourselves. Learning commences after the student respectfully submits to Him and states that he is ready and prepared for Learning. 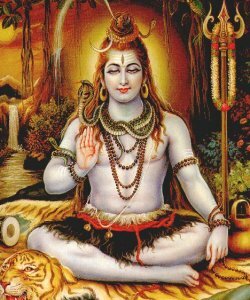 In Sanskrit language the student makes his submission to Lord Shiva : ” OM, NamaH Shivaya, Siddham NamaH.” An attitude of humility, and a willingness to accept personal responsibility and being mentally prepared before any Learning instruction is imparted are the first steps for Learning to begin. In my view, Lord Shiva presides over the frontal area( Prefrontal Cortex) of the human brain which is the seat of intellectual thoughts. 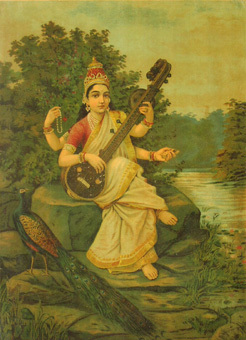 Sarasvati - The Goddess of Wisdom and Perfect Knowledge, the Goddess of Speech or Vaak presides over the Broca's Area, the Speech Center of the Brain. Sarasvati is the Goddess of Wisdom and Perfect Knowledge. Learning is not about the mere exposure of a student to new information. Learning involves the process of assimilation of new information and an ability to analyze that information, and to formulate an opinion based upon that information. The student should be able to express that information in his speech and prove that he had imbibed the information in a critical manner. Sarasvati is also the Goddess of Speech or “Vaak” and controls the Speech Center or Area of the brain known as Broca’s Area. She banishes mental lethargy, mental laziness which impedes the ability to learn new information. She removes the mental barriers, the mental fences that we erect which disrupt ‘mental fluidity’, the fluid dynamics required for smooth flow of mental impulses between different areas of the brain involved in Learning and Speech. 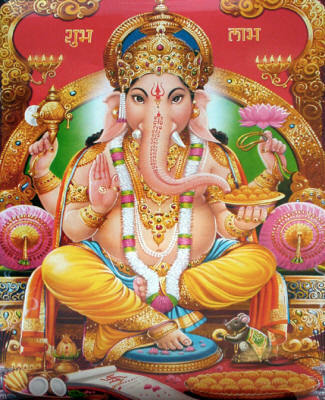 Lord Ganesha - The Mentor of Learning, the Remover of Obstacles. Lord Ganesha is the Mentor of Learning. Learning is a complicated process. At individual level, it needs neuro-muscular coordination and at an external level it needs the removal of all distractions that interfere with the process of Learning. Ganesha removes all obstacles that could prevent the student from his pursuit of Learning. 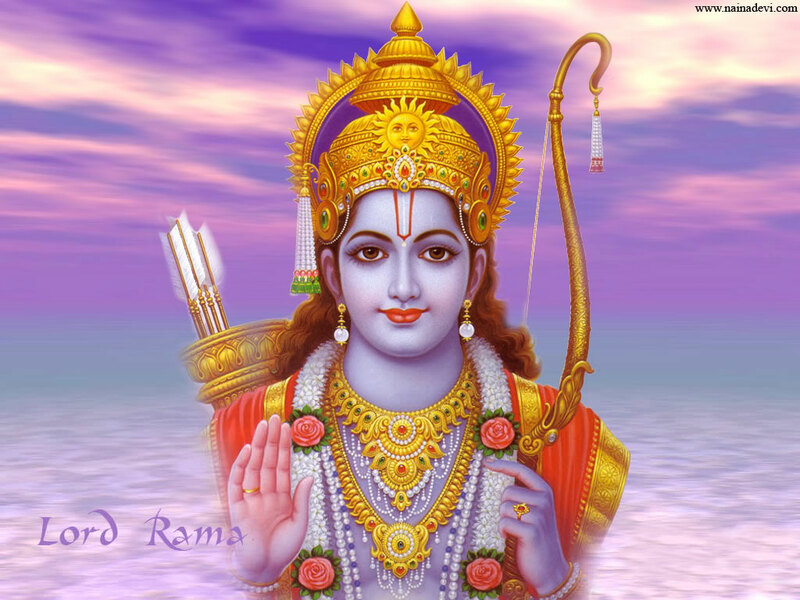 Lord Rama is the source of inspiration to writers, musicians, dancers, and other artists and craftsmen. Apart from the three personalities, the student can choose an image of his choice to specifically draw inspiration while he travels on the path of Learning. The personality of Lord Rama alone had inspired thousands of Indians to express their devotion to Him in creative and distinctive ways.In the Indian Tradition, the ‘GURU’ or the teacher has a very unique position and is elevated to the status of the Divine Trinity represented by Brahma (the Creator), Vishnu (the Protector), and Shiva (the Restorer). George Bernard Shaw - July 26, 1856 to November 2, 1950 - Author of more than 60 plays, distinguished essayist, music critic, the only person who won a Nobel Prize for Literature and also an Academy Award. George Bernard Shaw apart from being a great playwright, was an influential music and drama critic, a superb essayist, and a penetrating analyst of virtually every important aspect of Western culture. The adjective ‘Shavian’ describes anything resembling his distinctive ideas or personality. Shaw rejected orthodoxy to become an atheist and a Darwinist, and moved through radical anarchism, Marxism to Socialism. He had finally arrived at Creative Evolution which viewed life as a whole and over an infinite time span. I could use his image to inspire myself while I indulge in expressing my thoughts, but I cannot draw any inspiration from his distinctive ideas and use them as a basis for my writing. Row, row, row your boat, Gently down the Stream; Merrily, merrily, merrily, merrily, Life is but a Dream. Jeff Kass is a teacher of Creative Writing at Pioneer High School in Ann Arbor and he also teaches at the Eastern Michigan University in Ypsilanti, Michigan. He teaches four sections of Creative Writing per day and over 110 students attend his classes to learn Creative Writing at Pioneer High School. He had included a quotation from the playwright George Bernard Shaw in the hand-out for his class and had designated the quotation as the Mission Statement for what his students will be doing throughout the semester. The quote is as follows: ” I want to be thoroughly used up when I die, for the harder I work, the more I live.” Jeff Kass has further instructed his students : “I want you to be thoroughly used up. 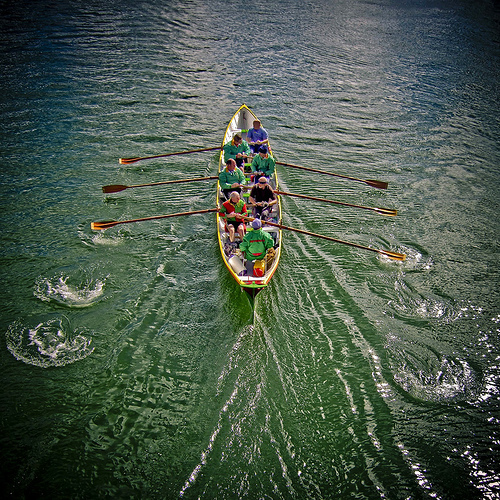 I want you to feel like you gave this class everything you possibly could and you have nothing left.” He drew the analogy of a boating crew, the athletes who compete in boating races. These athletes at the end of the race are very physically exhausted, they manage to hobble across the dock without an ounce of energy left in their bodies. Jeff Kass has stated that his Creative Writing Class students may experience a figurative death at the end of their semester as they are thoroughly used up. A Creative Writer never dies as he always lives through the thoughts that he had expressed in his Writing. We come into existence as individuals. We are created as persons with qualities and characteristics that set us apart from others. Our personal identity relates to the condition of being an individual or different from others. The students of the Creative Writing class should be able to describe their ‘Individuality’. For Creative Writing, the individual need to express his original, distinctive ideas, the ideas that set him apart from the ideas expressed by other individuals. The ‘Individuality’ is not related to the individual’s skin color, hair color,or the glasses the individual may wear. The ‘Individuality’ exists in the thoughts and which when expressed in words speak about the ‘Creativity’ of the individual. The students of the Creative writing class should seek to exist as individuals, capable of thinking for themselves, form their own opinions, and express their own distinctive ideas. The Class should provide tools to students to express their ‘Individualism’. Raas Leela - Lord Krishna in Vrindavan dancing with Gopis. Lord Krishna is simultaneously ONE and also DIFFERENT. He is the manifestation of Creative Energy.This Group Dance is an example of 'Individualistic Rhythm'. Jeff Kass encourages his students to perform a ‘Group Dance’ to encourage them to share their thoughts with the ‘Group’ and getting connected to them.The individual always exists in an environment. For Creative Writing, the individual need to get connected to his ‘Inner self’, set himself apart from the social group to which he may belong. His concern should not be about the ‘Group’. His concern should be to focus on his own thoughts about everything else. What he thinks about the ‘Group’ is more relevant than being part of the ‘Group’. Creative Writing is not like the ‘Group Dance’ and it describes the ‘Individualistic Rhythm’. 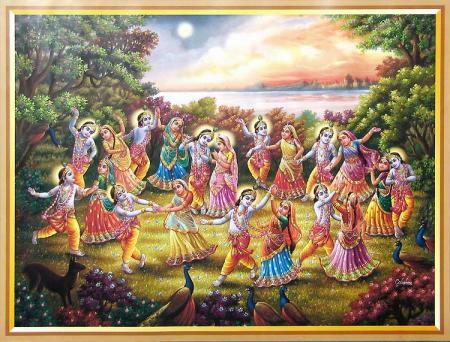 Lord Krishna in the above illustration is seen dancing with a Group of maidens known as Gopis. He appears before each of His dancing partner as a DIFFERENT individual. He uses His Creative Energy to perform His Individualistic Rhythm. Creativity gives us the ability to express individualistic variation and define our Identity in thought and action. The Creative Writing Class has started with an incomplete quote from playwright George Bernard Shaw. The quote should read as follows :”I am of the opinion that my life belongs to the whole community and as long as I live, it is my privilege to do for it whatever I can. I want to be thoroughly used up when I die, for the harder I work the more I live.” This is GBS’s view about the purpose of his human life and existence and hence the quote cannot be used to inspire students learning the Art of Creative Writing. For Creative Writing, the individual must first recognize his individuality, define his identity and purpose, and get connected to his ‘inner self’ before paying attention to the social community or “GROUP”. This flawed ‘Mission Statement’ is now getting expressed in the ‘Reflections’ of the students. Two of the students of this Class had used a homophobic word in written assignments submitted to the teacher. Sexuality describes our attitude about human sexual relationships. A Creative Writer should first learn to express his/her ideas about his/her own gender. The same applies to issues such as race, religion, or ethnicity. The Creative Writer must be given the tools to express ideas and thoughts that explain his/her gender, race, ethnicity, physical or anthropometric identity, and purpose in life before venturing to express opinions about relationships with others. The student should first recognize the difference between an ‘idea’ and an ‘opinion’. The Class should aim at expressing ‘ideas’ and not upon voicing ‘opinions’. By including the ‘opinion’ of GBS in the ‘Mission Statement’, the students are given the wrong impression that their purpose is that of expressing ‘opinions’. If I am a male, my own personal awareness of my gender is more important than expressing that gender identity in the context of homophobia. A Creative Writer needs to express unique, and distinctive ideas and such ideas would arise only if he/she understands his/her own self. In the last three weeks, the teacher at Pioneer High School has publicly disclosed verbal or written statements of his Creative Writing Class students without giving them a prior warning. It would be appropriate to disclose to the students that their statements would be publicly disclosed and would be openly debated by the rest of the Community. A physician who may have seen or diagnosed the pregnancy of the teen in the Creative Writing Class would not have divulged that information to others. A priest who may hear confessional statements of his parishioners would not disclose them to the rest of the congregation. I wonder if there is a confidentiality clause in the teacher-pupil relationship. At a minimum, the students should be aware of the blog postings of their teacher and the public discussion. It is relevant as the teacher has not set boundaries to the freedom of speech in the context of his lesson plans. The homophobic word or expression in the written assignments rendered by two students should be evaluated for its academic merit. It appears that the students who used the words have not yet acquired narrative skills. The word ‘idea’ in the context of Creative Writing could be defined as something one thinks, a thought, mental conception, or image. Students should be encouraged to visualize their ideas and then describe their mental pictures or images. The ‘reflective’ statements with the homophobic word lack this quality; a clear description of a mental image or picture and from an academic point of view, a creative idea is not described or stated. The word ‘opinion’ is defined as a mental conviction, a belief, an evaluation, impression, estimation, or judgment of the quality or worth of a person or thing; a conclusion affected by one’s personal manner of looking at things. The homophobic word qualifies as an ‘opinion’ and if it is used as an ‘idea’, the mental concept or image is poorly narrated. Creative Writing demands that the writer should project his mental concepts in a vivid manner and a reader should be able to visualize that ‘idea’ described by the author. It is a teachable moment to the teachers as the incident reveals the pitfalls of inadequate instruction. Set your Mind Free – Let Sarasvati Flow . Posted byWholeDude September 21, 2009 July 7, 2010 Posted inBhavanajagat, East is East and West is West, Indian Identity-Indian Culture, Rebbapragada, Religion-Faith-Dharm-Belief and DisbeliefTags: Creativity and Creative Writing, Dr R Rudra Narasimham Medical Officer Operation Eagle Chittagong Hill Tracts 1971, God of Learning, Goddess of Wisdom, Goddess Sarasvati, Individualism, Individualistic Rhythm, Jeff Kass, Kurnool Medical College, Lord Ganesha, Lord Krishna, Lord Rama, Lord Shiva, Mental Fluidity and Creativity, Mentor of Learning, Pioneer High School Ann Arbor, Raas Leela a Group Dance, Row row row your boat, What is Man? Absolutely concur with the way you put it – East vs West. I like your blogs for one reason as they contain elements of Spiritualism,Medicine,your experiences Indian Army Medical Corps. Awesome explanation of Hindu Gods and their significance in education. This is my first time here. Will keep coming back to learn new and interesting things from your blog. WELL DONE ! YOU ARE A DOCTOR BY PROFESSION , AT THE SAME TIME SOUND KNOWLEDHE ABOUT HINDU WAY OF LIFE ! GREAT . Thanks for visiting this blog post. I am glad to read that you have liked my presentation.